Ten fables with pretty pictures and explicit, if not always apt, morals. 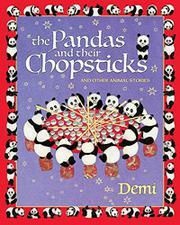 Recast from unspecified originals, this collection of minitales opens with the titular vision of hungry pandas seated around two tables and holding very long chopsticks—a version of which appeared previously in the author’s Chinese Zoo (1987). They solve the problem of how to eat by feeding one another with their 3-foot chopsticks. Its moral—“Be generous. It brings happiness to everyone”—seems a little off-target given that nobody’s giving away any food that belongs to them. Hubris is examined in an encounter between a kite and a butterfly (“Hello butterfly! I am so much higher than you! Aren’t you just a little bit jealous of me?”) and another between a proud river and the huge but humble ocean. Humility also features in the moral to the story of a turtle who “flies” on a stick lifted by birds until he opens his mouth. Since he’s cast as garrulous rather than proud and lands in a lake as he wanted to do rather than dying, there’s not much cautionary force to the episode. Creatures drawn with delicate, calligraphic strokes float in negative space on the pages within patterned borders, and though details in some stories aren’t depicted literally, the art adds a vivacious energy to each episode.